Climate change predictions posit that Mediterranean water bodies will be affected harshly by increasing droughts (Fig. 1) and that temperate regions could be affected in the future. Although this problem is known, the European Water Framework Directive (European Commission, 2000, p. 60) (WFD) does not cover these types of rivers. The Directive should arguably extend their remit to IRES because these water bodies are often permanently used for agricultural and industry purposes. To support better management of IRES, the LIFE TRivers project was set up to create a software to identify Mediterranean IRES (Gallart et al., 2017) and compare the effectiveness of “normal flow” bioindicators (using macroinvertebrates, fishes, macrophytes and diatoms). Here we will focus on diatoms, since their short reproduction cycle makes them the best indicators of eutrophication (Hering et al., 2006). Their increased taxon richness in temporary rivers also makes them good indicators of connectivity disruption (Novais et al., 2014). Our research group sampled diatoms bimonthly in 24 Iberian rivers and streams following standard European guidelines for (perennial) rivers (CEN, 2014). These rivers were characterized by their flow characteristics (Fig. 2) and water regimes (dividing water bodies into perennial rivers, intermittently dry streams or intermittent pools). We identified 408 diatom taxa (Burfeid Castellanos, 2018) and categorized them by their life forms (Rimet and Bouchez, 2012), ecological guilds (Passy, 2007) and intrinsic characteristics (Round et al., 1990; Van Dam et al., 1994). These categories group diatom species by attachment mode to the substratum, intra- and interspecific species interactions, and resource (nutrients, light) utilization among others. 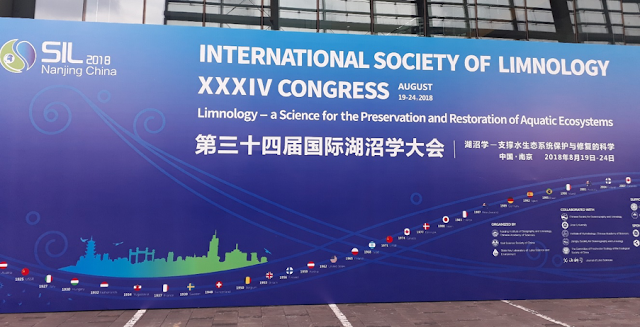 We also calculated index values (index of poluo-sensitivity and biological diatom index, hereafter IPS and IBD, respectively) to compare their suitability in IRES in the case of connectivity loss. Figure 2. Comparison of aquatic states of Mediterranean streams. 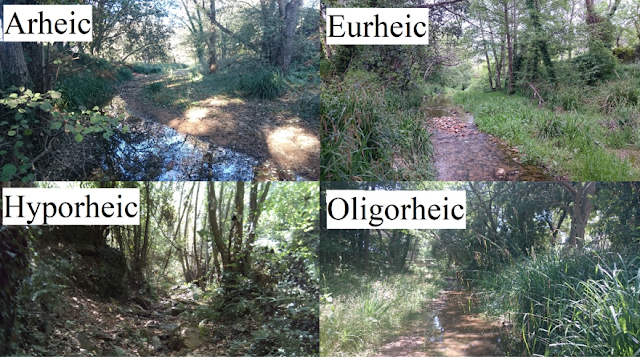 The Tossa Stream is depicted during arheic, eurheic and oligorheic conditions, while the Pineda stream is shown during hyporheic conditions. The results show that, even though diatom species were similar over time at each sampling site, distinct taxa, life forms, and ecological guilds were found in different aquatic states (Fig. 3). Mostly subaerial and epiphytic diatom species were found in hyporheic (saturated substrate) stream samples. In Arheic (pool) samples, however, diatoms tended to be related to lentic conditions in their taxonomy and functional characteristics. Taxa and life forms expected in lotic were found in systems with Oligorheic (reduced flow) and Eurheic (normal flow) states. Figure 3. Diatom genera and life forms found in different aquatic states (for more information see text above and Rimet and Bouchez, 2012). We found that diatom indices performed adequately only in permanently connected states in perennial rivers (Burfeid Castellanos et al., 2017a). Depending on the lack of perennial water flow, trophic indices, such as IPS and IBD, cannot reflect the shift towards drought-tolerant diatom taxa which are characterized by different appraisals of sensitivity and tolerance in each index (Burfeid Castellanos et al., 2017b). We concede that in arheic and hyporheic conditions sampling was inconsistent with the diatoms colonizing the sites. Therefore, we need a homogenous sampling methodology and a specialized bioindication index for temporary rivers to obtain more robust findings. We are currently working on a functional characterization of diatom communities of these temporary rivers to create a bioindication tool for these water bodies in the Iberian Peninsula*. *Recommendation: read about the analogous Balearic Island Index in reconnected temporary rivers (DiatMIB) (Delgado et al., 2012). This index studies not only diatoms, but also chlorophyll a concentration. This summary is based on the results of the project LIFE TRivers (LIFE13 ENV/ES000341) run by the freshwater ecology, hydrology and management lab of the University of Barcelona and coordinated by Núria Cid, whom I thank profusely. It was part of my doctoral thesis. I also thank Michael Kloster, Xavier Benito and Luca Marazzi for their constructive comments. If you have comments about this post, you can drop a message below, email Andrea and visit her web or connect with her Twitter. Becker, R.A., 2014. Effects of land use and climate variability on the water quality of Mediterranean rivers : Towards a regional vision of global change (Doctoral Thesis). University of Girona. Spain. Burfeid Castellanos, A.M., 2018. Ecological factors and diatom diversity at rivers of the Iberian Mediterranean river basins: macro-scale, meso-scale and micro-scale = Factores ecológicos y diversidad de diatomeas en los ríos de las cuencas hidrográficas del mediterráneo ibérico: maro-escala, meso-escala y micro-escala (Ph.D. Thesis). Universitat de Barcelona. Burfeid Castellanos, A.M., Flor-Arnau, N., Cid, N., Vinyoles, D., Fortunyo, P., Gallart, F., Latron, J., Llorens, P., Cambra, J., Prat, N., Rodríguez-Lozano, P., Bonada, N., 2017b. Effects of Temporary Rivers on Diatoms, in: XXI Symposium of Cryptogamic Botany. Aranjuez (Spain). CEN, 2014. UNE-EN 13946:2014 Water quality - Guidance for the routine sampling and preparation of benthic diatoms from rivers and lakes. 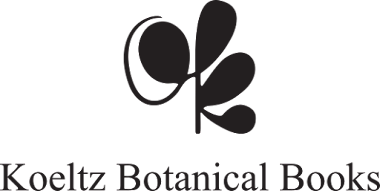 Datry, T., Moya, N., Zubieta, J., Oberdorff, T., 2016. Determinants of local and regional communities in intermittent and perennial headwaters of the Bolivian Amazon. Freshwater Biology 61, 1335–1349. European Commission, 2000. Directive 2000/60/EC of the European Parliament and of the Council of 23 October 2000 establishing a framework for community action in the field of water policy. Official Journal of the European Communities 327, 2–72. Round, F.E., Crawford, R.M., Mann, D.G., 1990. The diatoms: biology & morphology of the genera., 5th ed. Cambridge University Press.